Funny how they go to such lengths to try to disprove something they don’t even believe in. May God’s lovingkindness open their unbelieving eyes and shine his truth into their hearts. The Bible does not recognize “athiests” as far as I can see. God haters…..but not athiests. “Everyone” wants to go to heaven….they just don’t want God to be there!! I have never understood the athiest’s need to prove the Christian wrong. Who is it they are really trying to convince? maybe a civil rights point. 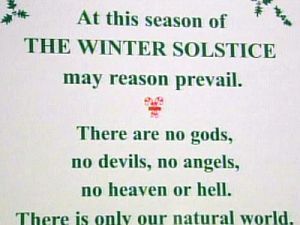 If atheists and winter solstice worshipers can express their “faith,” then so can we.